Hey Y'all! It's Mandee from The Kitchen Wife! Here in West Virginia, we are finally embarking on warm weather! I love this time of year. Why? Because this is the time of year where the meals get lighter, and the ingredients get fresher. A perfect example of this is my Chicken Pesto Pasta Salad. 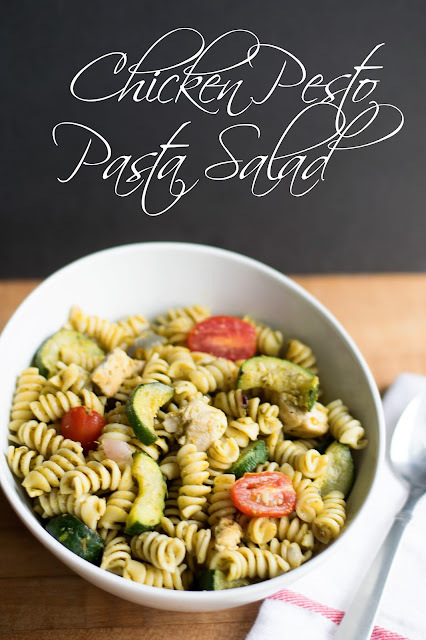 Packed full of savory chicken and fresh veggies, this Chicken Pesto Pasta Salad is the perfect summertime meal, ready in 20 minutes! I can't wait to share it with you so let's get started! The first thing you will need to do is bring a pot of salted water to a boil for your pasta. I usually put a tablespoon of salt in per a pound of pasta. This is important because it's the only chance you will have to actually season your pasta. Just before your pasta water comes to a boil, place a deep skillet over a HIGH heat and add the oil. Once the pan is HOT add the chicken. Season the chicken with salt and pepper, then let cook for 5 minutes until the chicken is fully cooked and golden brown. While your chicken is cooking, add the pasta to the boiling water and cook according to the instructions on the box. Once the chicken is fully cooked, remove it from the pan, lower the heat to MEDIUM/HIGH and add the zucchini, onions, and garlic. Season those with salt and pepper and cook for about 5 minutes, until just tender. Once your veggies are tender, you can return the chicken to the pan and turn off the heat. By now your pasta should be finished. Now add the entire jar of pesto sauce. Yes, you can totally make your own pesto for this dish if you like, but with so many great jarred options, I chose to go the easy way out. 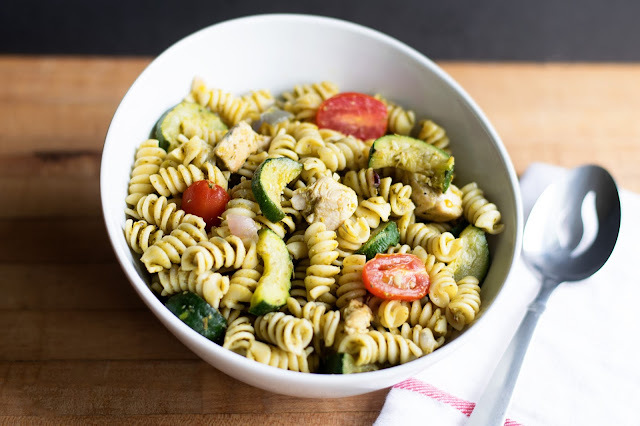 Toss everything together until all the ingredients are coated in the pesto. Then, last, but not least, top with the gorgeous cherry tomatoes. You can most definitely serve this warm, but it is equally delicious cold or at room temperature. For a cold salad, simply chill in the fridge for at least two hours, but overnight is best. I like to top with a little parmesan cheese and fresh basil. This Chicken Pesto Pasta Salad truly is a great summertime meal that the whole family will love so give it a try tonight! Oh, and I would love to hear what some of your favorite summertime meals are, so leave them in the comments below! Bring a pot of salted water to a boil and add the pasta. Cook according to the directions on the box. Place a deep pan over a High Heat and add the oil. Season the chicken with salt and pepper, and cook for 5 minutes. Once the chicken is fully cooked and golden brown, remove from the pan. Lower the heat to MEDIUM/HIGH and add the zucchini, onion, and garlic. Add the pasta and pesto to the pan and toss everything until all of the ingredients are coated in the pesto. You can serve hot, but for a chilled option, cool in the fridge for at least 2 hours or overnight.